Throughout this course, we've learned how to install Electron, integrate Menus, and work with Windows. Now, we're going to install Axios, which is an HTTP client that will allow us to request information from a free cryptocurrency service. We will use it to retrieve the current price of Bitcoin, and display that price in our app. Now, we're ready to use Axios to make a request. In this /src/index.js file, let's create a function that will retrieve the price of BTC. First, we're defining a variable to give us access to the h1 element, where the price of BTC will be displayed. Next, we're wrapping the Axios code in a function because we're going to call it at a 30 second interval shortly. Inside of getBTC(), we're using the axios .get() method to specify an address of a free public API for CryptoCurrency data called CryptoCompare. Then, we set the price.innerHTML to the response. We're using .toLocaleString to display it in a properly formatted number. This will call it initially, and then every 30 seconds! You could also put a loading graphic there if you wish. 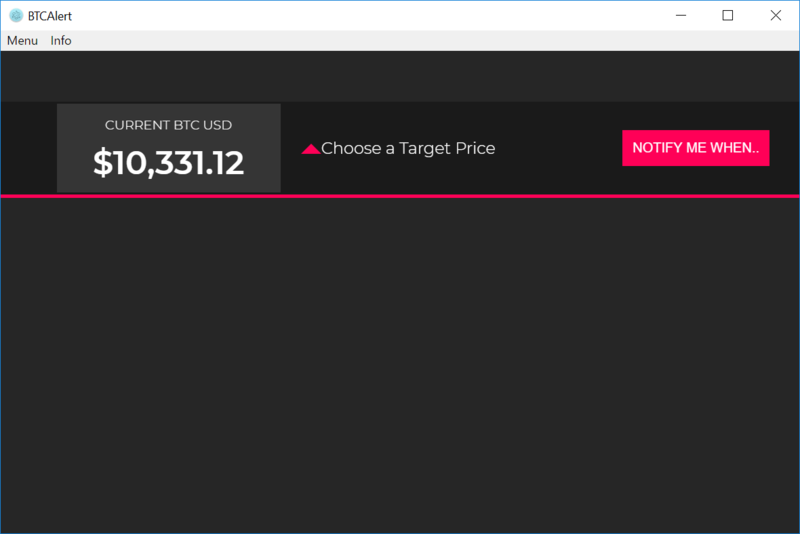 If you save the project and run npm start, you should see the current price of Bitcoin (BTC) displayed. We've made some great progress so far, but we're not nearly done yet. Now, we have to focus on adding the functionality for allowing a user to specify an alert price in the add.html window, and we need to communicate that information to the index.html window. To do this, we will cover IPC in Electron in the next lesson.